Nintendo President and CEO Satoru Iwata exercised his gift of gab yet again in the latest Iwata Asks, this time leaving no koopa shell unturned in a rousing discussion with the developers of Super Mario 3D World. Legendary Nintendo producer Shigeru Miyamoto sat down with his fellow 3D World designers to field Iwata's questions on everything from the game's title to director Kenta Motokura's insistence on throwing a vast wealth of content into the game. "It feels condensed and packed solid," remarked co-director Koichi Hayashida. Even Iwata commented that one of 3D World's trailers seemed filled with an incredible number of worlds, power-ups, and activities. The team went on to reveal that this was accomplished in part because 100 people were involved in the development of the game. 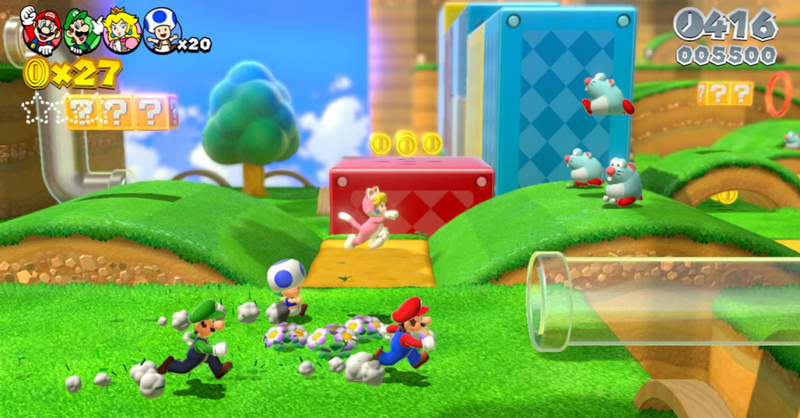 Hayashida also noted that the inclusion of multiplayer in Super Mario 3D World was a remnant of the desire to include a multiplayer mode in Super Mario 3D Land on the 3DS — an idea that was unfortunately never realized. Another major talking point in the interview session was the use of the game's camera. After a brief consideration of the historical use of camera angles in past 3D Nintendo titles, Motokura mentioned that 3D World's single-player features Free Camera Mode, which allows for complete customization of perspective using the gamepad's gyro function. 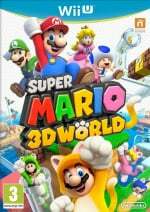 It seems like every day leading up to the launch of Super Mario 3D World is filled with newly announced characters, abilities, and fun facts. With this many surprises waiting around each turn and inside of every clear warp pipe, gamers will surely be in for a treat when, come 22nd November in North America and 29th November in Europe, they finally get a chance to insert Super Mario 3D World into their Wii Us and power star their way toward Bowser's castle. Come on, Christmas present! And you go rosalina!! I'm wondering, if like 3D Land, it will have an additional 8 worlds after the first section. It already has so many extra modes. With Rosalina comes the demand for new characters so I'm just going to throw one off the bat! Yoshi! Not as a ridable Yoshi but as a playable-in-his-own-right Yoshi's Island Yoshi! If the game cannot be played with up to five players ("Boost Mode" doesn't count) then the inclusion of Rosalina is a complete waste of time. @LavaTwilight They said there will be no Yoshi in the game as a character. @sillygostly I don't think so... she clearly has a different moveset from the others. That said then maybe other potential characters to be Wario? Waluigi? Nabbit? @tsm7 looking at the amount of stamps that are available and the amount of levels in the 6 normal worlds, I think it's pretty likely. I expect Rosalina to be an alternative to Mario with the latter's Galaxy moveset, what with sharing developers with her home game as well as that spin attack of hers being a pretty major hint. This really is the BIG ONE, isn't it? What does "complete customization of perspective using the gamepad's gyro function" mean? Can we not use other methods of controlling the camera, ones without motion? This game gets better and better. Maybe just maybe, she will be playable in Smashbros? @Dark-Luigi You are reading my mind! I love Rosalina, so this was a great choice for me. To be honest she's the only mario character who has an emotional spectrum besides Luigi and Bowser Jr. I love that she is in the game. That actually makes me want to get the game at launch instead of December... This holiday season is looking quite promising. SN:"It's a good thing the pushed DK: Tropical Freeze for next year, hmmm?" @sillygostly She plays differently, I dont see how it's a waste of time. I think it's awesome that I'll be able to use the spin attack from Galaxy again. Different playstyles, dude! I really do want this game to be great and I REALLY hope it is (I'm talking like indisputable 9-10 scores across the board). The Wii U really needs a big clear cut critical hit right now and something that is going to drive sales. ^ High scores don't mean high sales though. That week delay for Europe is going to be the death of me. Not only will I have to avoid watching the entire game on Youtube for a week, but I won't even have Zelda to occupy me until the 27th when my 3DS XL bundle arrives. So Rosalina is available after you beat the game ? Am I understanding right ? "I was thinking about what would be pleasing after the ending"
Nintendo, you're making me curse the fact I have to wait until Christmas to play this. But hey, 'tis worth it! "single-player features Free Camera Mode, which allows for complete customization of perspective using the gamepad's gyro function"
Does this mean we have full 360 degree control again or not? Also I wish the camera just controlled using buttons rather than gyro. I can't stand pointing devices around the room in order to look around! Just eight more days until I can stomp some goomba face.... with Rosalina. Condensed and packed solid to me would be say 250 levels. (Of which you only play 100 first time through). @element187 What so it is designed to be played with the dpad ? (That makes no sense at all seen as it supports pretty much every control scheme). Now all we need is Daisy and yes, all the Nintendo princesses will get their recognition. I love me some Rosalina. @sillygostly No not really it allows more options. It's like in Mario Kart...only 4 people can play on one console at a time, so does that mean the characters other than the 4 that are chosen are a complete waste? No. It's not a waste, it's just offering variety. 00:54 - You can pass invincibility to allies by touching them. 01:53 - What does the crown do? 06:13 - Tanooki Leaf confirmed! This was a very thorough Iwata Asks, and I love it. I hope they'll eventually interview the music staff, like they did with the Galaxy games, because I really want to hear (or read, I guess) about their inspirations for the big band style. Sure, the Destructoid interview covered that a little bit, but Iwata tends to go more in depth.